Summary: The Florida Aquarium sea turtle rehabilitation program has provided care and support for injured and ill sea turtles since 1999. In addition to rehabilitating turtles that are rescued from our Florida waters, The Florida Aquarium also serves as one of the rehabilitation facilities for juvenile sea turtles that suffer from cold stunning off the coast of New England each fall and winter. We will improve our facility and program to allow for the care of greater numbers of turtles in an environment that supports even the most complex cases. 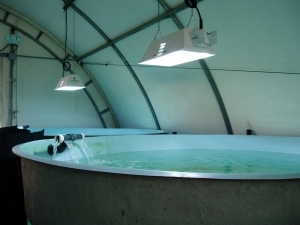 The addition of chlorine pumps and ultraviolet lights to the existing systems will improve sea turtle rehabilitation husbandry and potentially improve recovery times. Dividers for tanks will increase the numbers of sea turtles that can be housed at The Florida Aquarium. A new scale, transport sling and medical supplies will aid in the overall care, management and treatment of Florida marine turtles, as well as those that may come from other states. With increasing demands for rehabilitation space, The Florida Aquarium is striving to provide advanced care and treatment to as many sea turtles as the facility and staff can accommodate. Through rehabilitation efforts and public education, we hope to assist in the fight for the conservation of our threatened and endangered sea turtles.